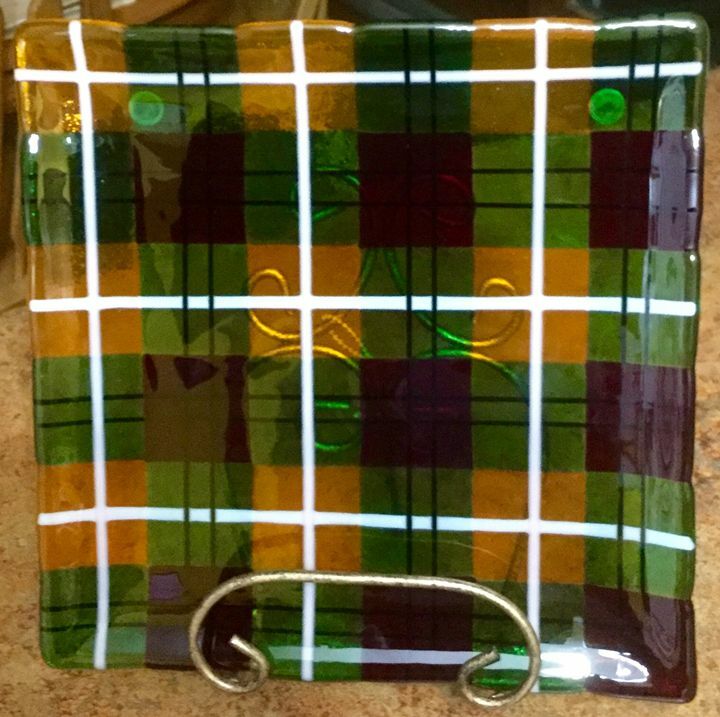 Original Fused glass plaid design platter. 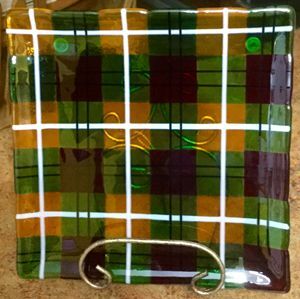 Two layers of transparent art glass in shades of yellow, red, and green laced with thin strips of black stringer and white "noodles" hand cut and pieced together and finally slumped to create a beautiful, gently curved, 10x10 plaid serving dish. Easily removable rubber bumpers attached to bottom to minimize contact with table surface. Estimated proper shipping charges, variability of size in items may create a discrepancy. Over charges collected compared to actual costs will be happily refunded to you at the time of shipping. Estimate for shipping is USPS First Class Mail or Priority Flat Rate, insured. Want faster shipping? Ask for quote for cost difference. I began working with glass as an art medium nearly 5 years ago. What began as a novel social outing at Water Street Glassworks, Benton Harbor, MI, grew into an enticing hobby and has become a joyous passion. I never imagined that the colors and shapes of the stained glass church windows and depression art glass originally appreciated in my childhood would lead me to this point. 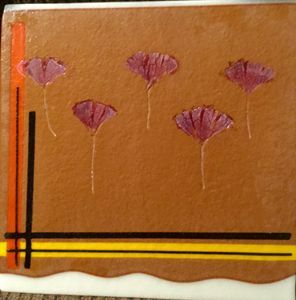 For inspiration, I find myself falling back on past experiences with a variety of art forms including clay, metal work, printmaking, photography, and fiber arts (crochet, sewing, and needle craft). I believe that working with glass allows me to blend my favorite qualities from each. I especially enjoy pairing vibrant colors with subtle tones in glass. Elements, textures, and patterns in nature have also found a place in my work. While I enjoy seeing pieces come out as planned, I have been taught to accept the unexpected results by embracing the "happy accidents" that turn out more beautiful than anything I had imagined. I hope to continually challenge myself with new glass experiences and incorporate what I have learned into my work. 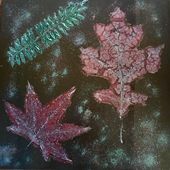 Look for my work at local markets in the late spring, summertime, seasonal shows, as well as several local galleries in Southwest MI ( Skip's European Market, Union Pier, MI; Chapel Hill Craft Show, Berrien Springs, MI; Water Street Glassworks, Benton Harbor, MI; or Ruby Slippers, Union Pier, MI). Also, you can find my pieces in Art-o-Mat's refurbished and repurposed cigarette vending machines in venues throughout the US and internationally.